For Pilots, Most Landings Are 'Routine' Procedure : The Two-Way Pilot Patrick Smith says that, for the most part, landings are not nearly as dramatic as passengers might think. And, he says, shorter, domestic routes can be more tiring than international flights. 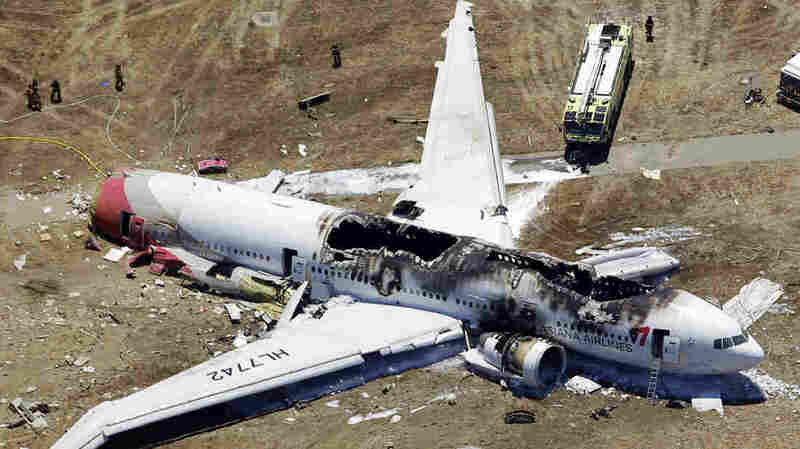 This aerial photo shows the wreckage of the Asiana Flight 214 airplane after it crashed at the San Francisco International Airport on Saturday. Two Chinese teenagers were killed and dozens of other passengers were injured when an Asiana Airlines Boeing 777's tail snapped off and the plane struck the ground just short of the runway on Saturday. Dramatic landings like this are ones commercial pilots hope to never encounter as they guide the hundreds of planes safely to the ground each day. Pilot Patrick Smith, the author of Cockpit Confidential, tells Rebecca Sheir, host of weekends on All Things Considered, that landings aren't nearly as exciting as they are for passengers or those watching from the ground. "It's not something we take for granted, but at the same time it's something we are trained for and that we do all the time," Smith says. "It does become routine to a point. The idea that every landing is this huge dramatic event wouldn't be healthy from a pilot's perspective." Smith has landed at San Francisco airport, the scene of Saturday's crash, several times. He says it's a more work-intensive environment than at some other airports, but it's something pilots deal with all the time. He says that like in any profession, some tasks demand more than others. The Boeing 777 had begun its trip in Shanghai, China, adding more passengers in South Korea before flying to the U.S. Smith says though that it is shorter, domestic routes that are more exhausting for pilots. "The reason there is because you're flying more legs, every day ... in and out of some of the busiest airports," he says. "It's more stressful [and] more fatiguing." The investigation into the exact cause of Saturday's crash is ongoing.